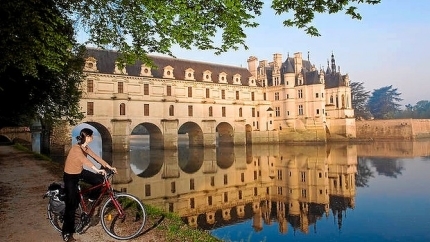 Let the tranquil waters of the Loire, Indre, and Cher rivers soothe you - body and soul - on the Loire Chateaux tour. Starting in Blois, you'll cycle through the heart of this region's vineyards and orchards, viewing some of the most picturesque scenery that France has to offer. The Loire Valley is a wonderful place. Rightfully famous for its famous Chateaux, there is a lot more to this beautiful valley. Among the sights you'll see are the last home of Leonardo da Vinci, the medieval treasure of Chenonceaux, and many exquisite and complex gardens, including the one at Amboise. Every turn in the Loire is a feast for the eyes. If you tire of chateaux, the charming villages offer a more casual atmosphere. Visit wine caves, museums, churches, and artisans at work. Or simply enjoy a croissant in a quiet cafe or garden. The flat-to-rolling terrain is perfect for cycling and is filled with trees and colours. For many visitors, the Loire Valley conjures pictures from the fairy tales of childhood.